For the village in Slovakia, see Ňárad. For other uses, see Narada (disambiguation). Narada (Sanskrit: नारद, Nārada) is a Vedic sage, famous in Hindu traditions as a traveling musician and storyteller, who carries news and enlightening wisdom. He appears in a number of Hindu texts, notably the Mahabharata and the Ramayana, as well as in the Puranas. In Indian texts, Narada travels to distant worlds and realms (Sanskrit: lokas). He is depicted carrying a khartal and tambura with the name Mahathi and is generally regarded as one of the great masters of the ancient musical instrument. This instrument is known by the name "mahathi" which he uses to accompany his singing of hymns, prayers and mantras. In the Vaishnavism tradition of Hinduism, he is presented as a sage with devotion to Lord Vishnu. Narada is described as both wise and mischievous, in humorous tales. Vaishnav enthusiasts depict him as a pure, elevated soul who glorifies Vishnu through his devotional songs, singing the names Hari and Narayana, and therein demonstrating bhakti yoga. The Narada Bhakti Sutra is attributed to him. Other texts named after Narada include Narada Purana and the Nāradasmṛti (pre 6th century CE text), the latter called the "juridical text par excellence" and represents the only Dharmaśāstra text which deals solely with juridical matters and ignoring those of righteous conduct and penance. The name Narada, referring to many different persons, appears in many mythical legends of Hinduism, as an earlier birth of Sariputta in the Jataka tales of Buddhism as well as names of medieval Buddhist scholars, and in Jainism. In the Mahabharata, Narada was conversant with the Vedas and the Upanishads and was acquainted with history and Puranas. He had mastery of the six Angas: pronunciation, grammar, prosody, terms, religious rites and astronomy. All celestial beings worshiped him for his knowledge - he is supposed to be well versed in all that occurred in ancient Kalpas (time cycles) and is termed to be conversant with Nyaya (logic) and the truth of moral science. He was a perfect master in re-conciliatory texts and differentiating in applying general principles to particular cases. He could swiftly interpret contraries by references to differences in situation. He was eloquent, resolute, intelligent and possessor of powerful memory. He knew the science of morals, politics, skilled in drawing inference from evidence, and very proficient in distinguishing inferior things from superior ones. He was competent in judging the correctness and incorrectness of complex syllogistic statements consisting of 5 proponents. He was capable of arriving at definite conclusions about religion, wealth, pleasure and salvation. He possessed knowledge of this whole universe and everything surrounding it. He was capable of answering successively at Vrihaspati himself, while arguing. He was the master of the Sankhya and Yoga systems of philosophy, conversant with sciences of war and treaty and proficient in drawing conclusions of judging things not within a direct knowledge. He knew about the six sciences of treaty, war, military campaigns, maintenance of posts against the enemy and strategies of ambushes and reserves. He was a thorough master of every branch of learning. He was fond of war and music and was incapable of being repulsed by any science or any course of action. The Bhagavata Purana describes the story of Narada's spiritual enlightenment: He was the primary source of information among Gods, and is believed to be the first journalist on Earth. 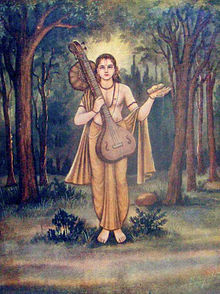 In his previous birth Narada was a Gandharva (angelic being) who had been cursed to be born on an earthly planet for singing glories to the demigods instead of the Supreme Lord. He was born as the son of a maid-servant of some particularly saintly priests . The priests, being pleased with both his and his mother's service, blessed him by allowing him to eat some of their food (prasad), previously offered to their lord, Vishnu. Gradually he received further blessings from these sages and heard them discussing many spiritual topics. After his mother died, he decided to roam the forest in search of enlightenment in understanding the 'Supreme Absolute Truth'. Reaching a tranquil forest location, after quenching his thirst from a nearby stream, he sat under a tree in meditation (yoga), concentrating on the paramatma form of Vishnu within his heart as he had been taught by the priests he had served. After some time Narada experienced a vision wherein Narayana (Vishnu) appeared before him, smiling, and spoke "that despite having the blessing of seeing him at that very moment, Narada would not be able to see his (Vishnu's) divine form again until he died". Narayan further explained that the reason he had been given a chance to see his form was because his beauty and love would be a source of inspiration and would fuel his dormant desire to be with the lord again. After instructing Narada in this manner, Vishnu then disappeared from his sight. The boy awoke from his meditation both thrilled and disappointed. For the rest of his life Narada focused on his devotion, meditation upon and worship to Vishnu. After his death Vishnu then blessed him with the spiritual form of "Narada" as he eventually became known. In many Hindu scriptures Narada is considered a saktyavesa-avatara or partial-manifestation (avatar) of God, empowered to perform miraculous tasks on Vishnu's behalf. Narada temples are few, most prominent being, Sri Narada Muni Temple at Chigateri, Karnataka. In Jainism, there are a total of 9 Naradas in every cycle of Jain Cosmology, current cycle's Naradas were Bhima, Mahabhima, Rudra, Maharudra, Kala, Mahakala, Durmukha, Narakamukha and Adhomukha. ^ a b James G. Lochtefeld (2002). The Illustrated Encyclopedia of Hinduism: N-Z. The Rosen Publishing Group. p. 461. ISBN 978-0-8239-3180-4. ^ Guy, Randor (31 July 2010). "Bhaktha Naradar 1942". The Hindu. Retrieved 9 October 2011. ^ Bhag-P 1.5.1 Narada is addressed as 'Vina-panih', meaning "one who carries a vina in his hand"
^ Devdutt Pattanaik (2000). The Goddess in India: The Five Faces of the Eternal Feminine. Inner Traditions. p. 80. ISBN 978-0-89281-807-5. ^ Sarah Shaw (2006). THE JATAKAS: Birth Stories of Bodhisatta. Penguin Books. p. 497. ISBN 978-81-8475-034-8. ^ Martin Ramstedt (2005). Hinduism in Modern Indonesia. Routledge. p. 50. ISBN 978-1-135-79052-3. ^ Helmuth von Glasenapp (1999). Jainism: An Indian Religion of Salvation. Motilal Banarsidass. pp. 273 with footnotes. ISBN 978-81-208-1376-2. ^ Doniger 1999, p. 550. Wikimedia Commons has media related to Narada.